Did you know that hang tags are the perfect way to showcase your company brand? Custom hang tags serves as an opportunity for a customer to remember your brand. Are you searching for eco-friendly hang tags? 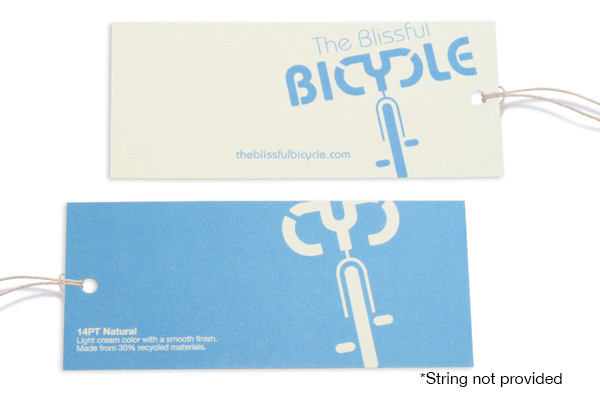 Our Natural hang tags are 30% recycled that presents a light color with an elegant, smooth finish. Get noticed by including a business logo, product details & price, tagline, quotes, business story, contact information, and other essential information. Choose from a variety of dimensions and printing options to fit the marketing or creative needs with this premium eco-friendly hang tags. Paper: 14PT Uncoated Natural Cream Card Stock. Contains 30% recycled materials.